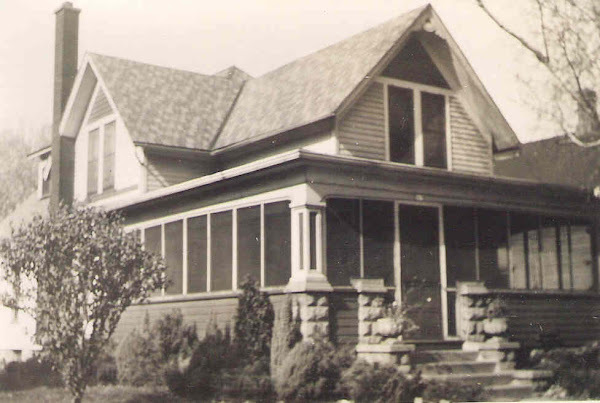 Since 2004, Historical Research Partners has helped individuals answer questions about their genealogy and/or the history (or genealogy) of their house. We have helped clients answer questions including when was my house built, who built it, what interesting events happened here, etc. We are willing to work with you to discover whatever level of detail you want. We hope you enjoy some of the stories of the interesting people and places that we have researched over the years. Adams' prediction was accurate, but the date of celebration falls on July 4, not July 2. Hence, from 1776 until today, Americans have chosen to celebrate the Day of Independence in much the same fashion. For a time, Friday afternoon, the village of Huron was threatened with a most disastrous fire, which seemed likely to sweep the river front and spread to business blocks. The dying down of the wind, however, prevented such a disaster, and the blaze was practically confined to four buildings, the lumber yards being saved. The total loss is estimated at about $12,000 or $13,000, with but little insurance being given above. The fire broke out in the fish and twine warehouse of Hermes and Scott, on the river front, near the Fries lumber yards, and spread rapidly. A half dozen people saw the blaze break out about 4:30 and turned in the alarm. How the fire started no one knows. A puff of black smoke suddenly burst out of a window on the first floor, and in another moment the building was a mass of flames. No one had been near the building, and no fire was near the place, so far as is known. The day before, a large quantity of nets and twine had been freshly tarred and stored in the building, and this burned like tinder. Huron has no fire department to speak of. There is one little hand engine and a supply of hose, and a volunteer company, of which Henry Shaffer is chief. The firemen turned out in good order, and soon had the little engine manned, but the sickly stream of water thrown was of no avail. The flames rapidly spread to the large fish warehouse of W.C. Heyman, and also to Heyman’s ice house. When it was seen that the fire was likely to spread to the lumber yards, an urgent appeal for help was sent to Sandusky. It required time to make up a special train and get the big steamer loaded on, but a quick run was made and by 5:45, the Sandusky firemen were on hand and ready for business. By that time, however, the fire was well under control, and there was nothing to do but turn a stream onto the ruins and keep the fire in check as a precaution against a possible high wind. Huron will feel the loss by fire severely. In both fish houses, there were quantities of twine which were destroyed. The ice, owned by C.A. Weichel, was considerably damaged and may be worthless. It is not likely that the warehouses will be rebuilt, and this makes the loss the more severe for Huron people. They consider themselves fortunate; however, in that the fire came at a time when there was little wind, for had the strong north wind of the last few days been blowing, nothing would have saved the lumber yards and many buildings in the vicinity. It was the hard work of the Huron firemen and citizens that saved much loss in the lumber yard. Before the steamer arrived from Sandusky, the blaze had spread to a barn adjoining the lumber piles. On the second floor of this barn was stored a quantity of fine lumber. As the lower part of the barn was burned away, the floor fell. Then men went to work tearing down parts of the burning building and removing the lumber. One pile of lumber was also torn down, and this prevented a further spread of fire. At one time, the large lumber ware house was on fire, so great was the heat, but this blaze was extinguished. The loss to the Fries estate will not exceed a thousand dollars. Two vessels, the tug Industry and the barge Columbia were lying in the river adjoining the fish houses, but they were not in much danger at any time. The fire attracted a great crowd of people, and cars running to Huron from both east and west carried many people. 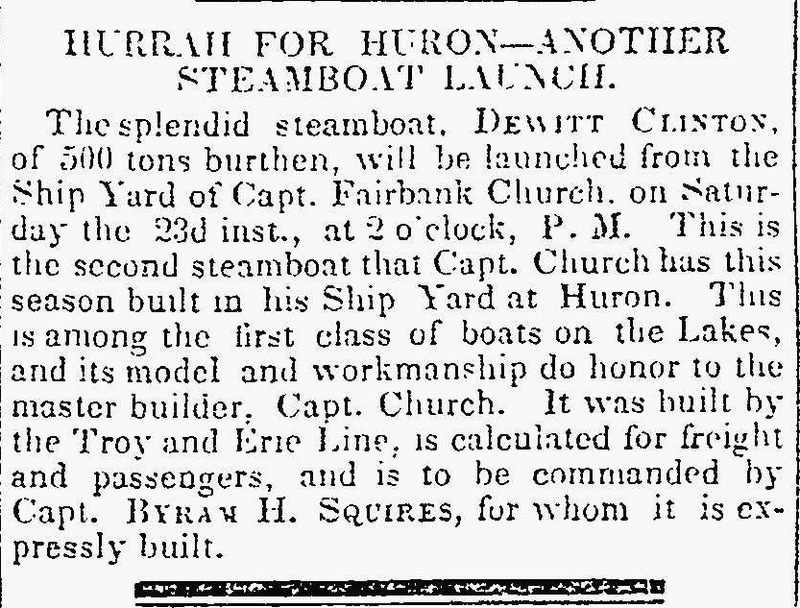 When the Sandusky steamer was started, there was a novel sight for the Huron folks. Their chief regrets that the firemen did not reach them earlier. Due to a general lack of proper maintenance, historic structures often come with a host of unforeseen problems. Nonetheless, the integrity with which these structures were built and the quality of the craftsmanship is often unparalleled in today’s world. If you own an older house or building or are simply interested in the preservation of historic structures, you can gain valuable information by attending the upcoming Building Doctor Clinic in Vermilion. The Ohio Historical Society’s Building Doctors are specifically trained to teach those who own historic structures how to recognize and solve some of the most common problems associated with maintaining those structures and how to make informed decisions about repairs and improvements. According to the Ohio Historical Society’s web site, “Each Building Doctor clinic begins with a free seminar on topics like peeling paint and failing plaster, wet basements, deteriorating masonry, windows, wood issues, and bringing buildings built before 1955 up to date without sacrificing historic integrity. On the following day, the Building Doctors make the rounds of ailing buildings within five miles of the city center where the seminar is held to examine problems and prescribe cures.” The site visits are free, but only about 10 inspections will be performed. Hence, it is imperative that interested parties register for the seminar and then make an appointment with the Building Doctor for a site visit. The Building Doctors will visit any pre-1955 building including schools, churches, factories, stores, offices, farm buildings, and homes. The Building Doctors only give six programs per year. On April 11, they will be visiting Vermilion and presenting their program at the Ritter Public Library at 7:00 PM. Site visits will take place on Friday, April 12 from 9:00 AM until 3:00 PM. Registration for the seminar and the site visits is can be completed online at www.ohpo.org/gis/BDindex.htm or by calling 1-800-499-2470. The Building Doctor Program is being co-sponsored by Main Street Vermilion, Inc. and the Sandusky/Erie County Community Foundation. Further information about the program in Vermilion should be directed to Linda Tallitsch at 440-963-0772. If you cannot attend the program in Vermilion, the Building Doctors will be visiting Port Clinton in September. Alternately, the Building Doctors will make a ‘Virtual Site Visit’ if you have one or two technical questions that you would like to ask. Questions should be directed to the Building Doctors at ohpo@ohiohistory.org. Follow articles I write at www.HuronHometownNews.com. No upcoming programs scheduled at the moment. Give me a call or message me if you would like me to speak for your group or organization. All content is property of Historical Research Partners, Huron, Ohio. Travel theme. Powered by Blogger.